In 1990-91, a company by the name of Pro Set released a new set of hockey cards onto the market. What was expected to be a solid seller for years to come, quickly turned into a dud only a few years later. The Pro Set card releases helped create an over saturated market for hockey cards in the 90’s, making them worthless today. 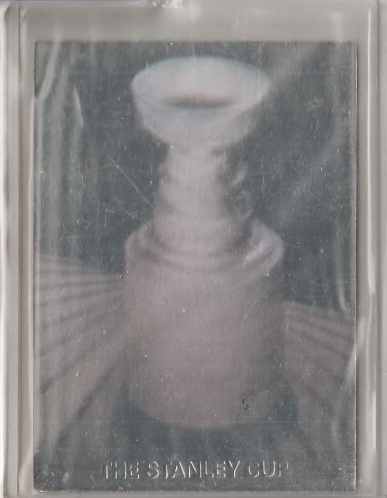 However during the boom years of Pro Set, the company created a buzz by including a limited Stanley Cup Hologram card that was very hard to find. People at one point paid north of $500 dollars to own the holy grail of that years set. Today the same card can be found around the $100 mark and I always try to pick one up when I see them. They are still very scarce in today’s market. One theory I have is that many of these cards may be tucked away in collections and the remainder are still in the sealed skids of wax available of this product. Yes there are a bazillion of these boxes still available and can be purchased for less than $10 dollars a box. I do pick up the odd box or two and will quickly recycle the useless commons in hopes of finding another Stanley Cup Hologram card. Note: There are still some common error cards that do fetch some ridiculous prices but that happens very rarely. So here is the card that I am speaking of. I currently own 2 of these. Ah very cool!! ITs a nice card!! I own three of these. One I found in a pack and the other two I bought. The two I bought are unsigned/numbered and one actually was not stamped “the stanley cup” on the front. Are these two true error cards or did I make a bad purchase? Are they valuable? They sell between $50 to $100 from what I have seen. As to indicate whether or not yours are special ones, I’d say it might be. The best way to tell is to possibly offer it up for sale or take it to shops and see how keen the dealers are to buy it. If it were me, I would love a copy of it regardless of the errors. From a hobby standpoint, Pro Set was wracked with error cards. Some are more valuable than others but still valuable. I’d say you did alright as long as you didnt pay more than what I said above. Does that help? Are these Stanley Cup holograms inserted in the Series 1 or Series 2 boxes? I am not sure. These cards are serial numbered on the back. I believe the Stanley cup error refers to the small image of the cup appearing randomly on the cards themselves. From what I recall, they are very collectible. I have one in hand and just picked one up on eBay for $80 on a Buy it Now option. I have a feeling it was up for sale for about a minute when I saw it! I have not seen one of these up for sale on eBay in about a year so if I see it, I buy it. Total shock that it wasn’t up on auction. I have been offered full book value for my not so mint version of this card. Sorry, it’s not for sale… Yet. enjoy it while you have it! its good to see people out there still enjoying cards! for sure.. if you don’t enjoy it, its not the right thing for ya! Please contact me regarding your Stanley Cup Hologram cards. J’ai le #959 de 5000.quelqu’un intéressé ?? you have a card for sale?